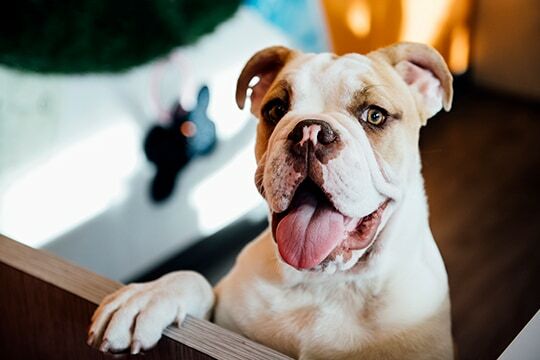 From business trips and vacations to home renovations, sometimes it’s just not possible for your furry family member to stay at your house. 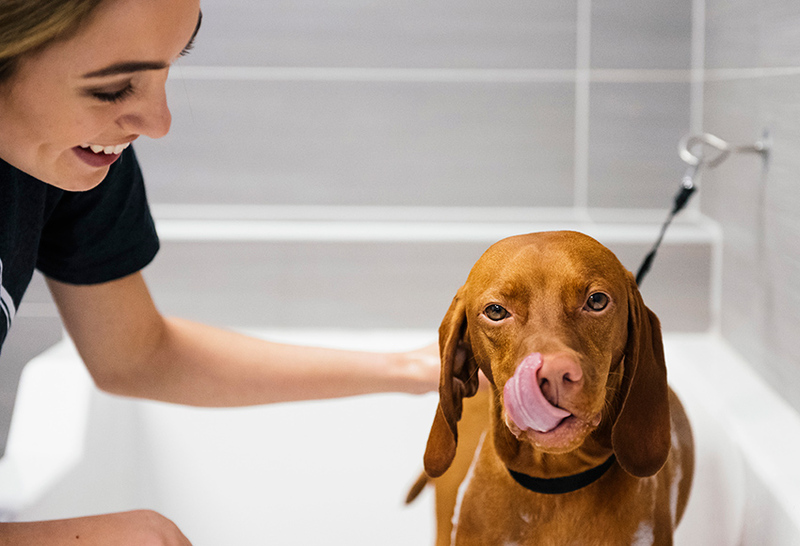 At Dogtopia of Bloor West Village, you can treat your pup to a vacation of their own with our overnight and extended boarding services. Rest assured, our knowledgeable and loving team will treat your pup like their own, providing the love and attention they deserve. Due to the city of Toronto zoning and bylaws, we are not permitted to offer on-site boarding services in Bloor West Village. Therefore, we shuttle our boarding pups to the Dogtopia of Newmarket location and they stay and play there for the duration of their vacation. This means pet parents can drop off their dogs by 11AM, and then they will be comfortably transported to Dogtopia of Newmarket using safe Kurgo seat belts. All of the boarding arrangements can be made through Dogtopia of Bloor. Should you wish to pick up and drop off at Newmarket, you can organize the boarding stay directly through Dogtopia of Newmarket. Our boarding dogs have the most exciting time as they are treated to all the benefits our daycare dogs receive. 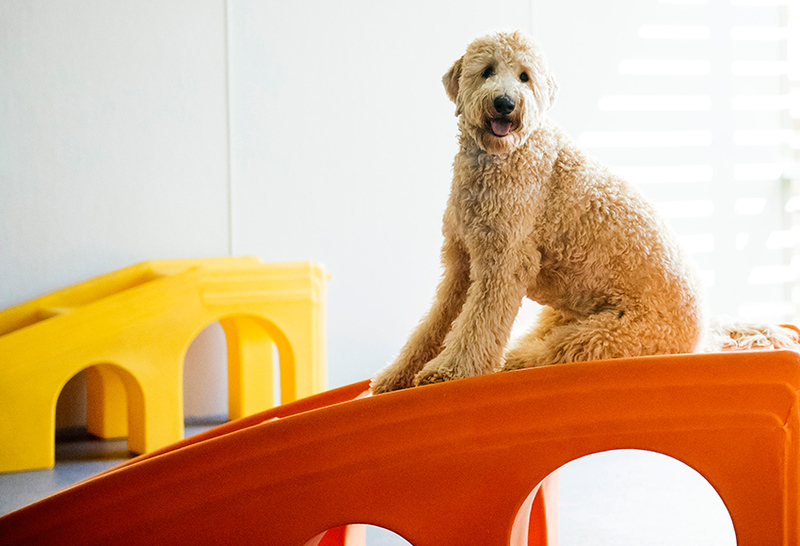 This means they will enjoy 8-10 hours of safe, supervised off-leash and open play with other boarding and daycare pups. This will allow your dog to burn off energy while running around with their BFFFs (best furry friends forever). You can check it out for yourself by accessing our live webcams that are located in each of four our playrooms. Our live webcams are easily accessible on our website or free through the mobile app. 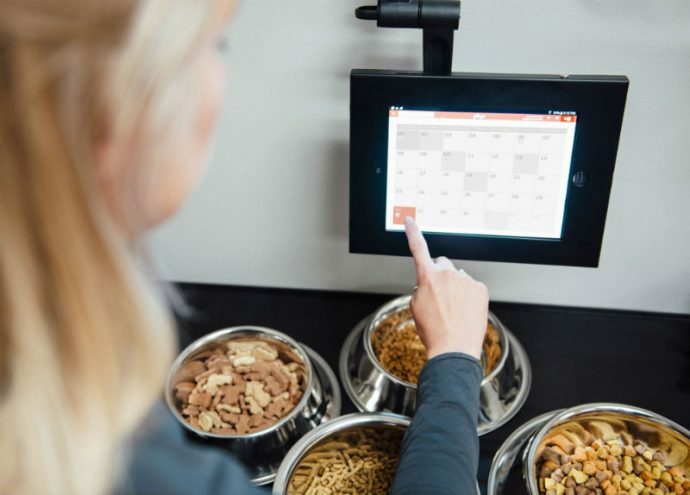 When boarding your dog at Dogtopia of Bloor West Village, they will receive breakfast and dinner service, as well as lunch for pups under the age of 7 months. We understand the importance of maintaining a regular diet, which is why we recommend that you bring in your dog’s normal food. We can also accommodate dogs with dietary restrictions and can administer medication (minus injections) as needed. As pet parents ourselves, we understand how important it is for our furry family members get plenty of TLC. Your dog will receive tons of love and affection during their time with us and will be treated with the utmost respect and tender care. After a fun-filled day of play, your pup will be exhausted and ready for bed! At bedtime, we use home-style crates for a safe, personalized area for your dog to rest in. Our larger, spacious suites are also available and can be reserved for a nominal fee. It is recommended that you bring your pup’s bedding to help with any homesickness or separation anxiety they may experience, as well as making them feel more comfortable and relaxed during their stay with us. You can also rest easy knowing that overnight supervision is also provided to all of our boarding guests. We are committed to keeping your pup safe and comfortable during their stay with us. 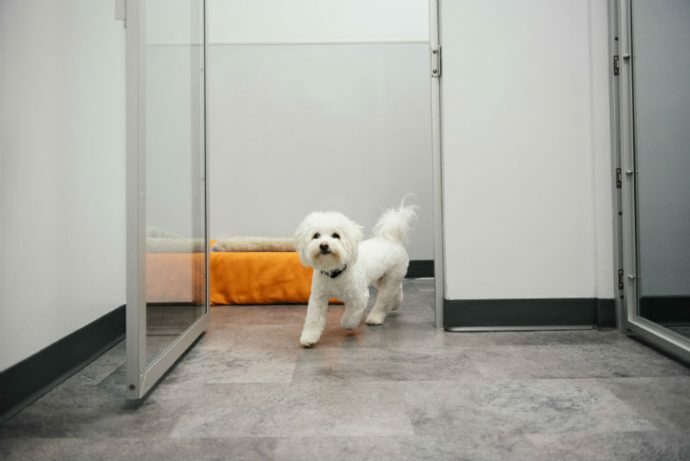 In order for us to give your dog the highest quality of care, we require each dog to come into our facility for a Meet & Greet evaluation beforehand. 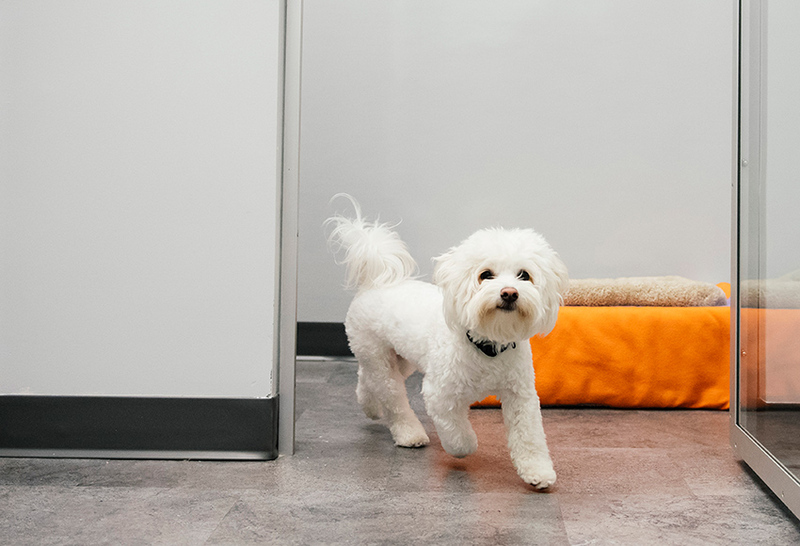 This helps us determine if your pup is well suited to play in our off-leash, open-play environment with the other dogs, and allows your dog to get well acquainted with our facility and certified Canine Coaches. All dogs are unique, which means they all require custom care. 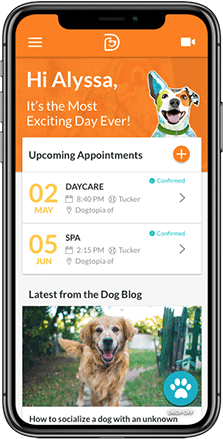 Our Meet & Greet session will help us determine your pup’s likes and dislikes and learn more about them, making their boarding stay with us as enjoyable as possible. We also require a minimum of two daycare days in advance of boarding, in order to ensure the best possible boarding play and stay. At Dogtopia of Bloor West Village, we value every dog as a member of our family and are committed to providing the highest quality of care. 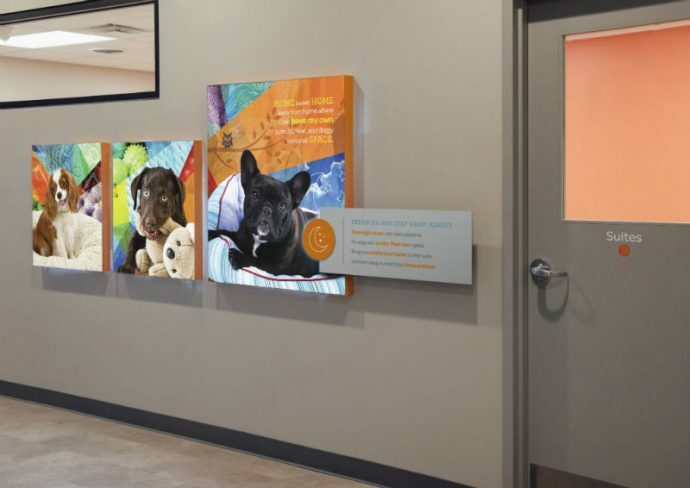 Our friendly and knowledgeable team will work closely with you to determine the best possible boarding options to fit the needs of both you and your pup. Boarding space is limited, so we recommend booking your Meet & Greet session in advance by filling out our contact form or giving us a call at (437) 317-4380. Boarding can be booked using a daily daycare pass and nightly fee/credit. Passes are for boarding and daycare, so you can always use the passes for daycare in the future. When you sign up for a membership you may use your credits towards a deduction off passes.